The exterior is constructed from sheet steel finished in an easy clean epoxy powder coated paint. The interior is made from mild steel coated with aluminium (CLAD), with a stainless steel chamber available as an option. 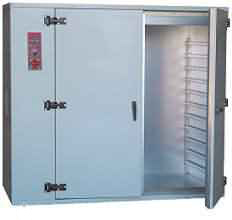 A range of larger volume, highly efficient, accurate, and reliable ovens, suitable for drying, curing, general laboratory and industrial use. The controls are easily visible and consist of a microprocessor based digital temperature controller with set-point and process displays, providing accurate fully automatic control. The controller includes thermocouple break protection. For safety an adjustable independent over-temperature thermostat is fitted as standard. 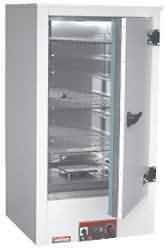 Options include: stainless steel chamber / choice of temperature and over-temperature controls / programmers / recorders / communications / timers / floor stands / extraction systems / trolleys / racking, etc.